St. Paul’s wanderings were not without profit. Galatians, being the first Epistle after Luke’s Acts of the Apostles, relates Paul’s working through how his life had changed since his theophany of Jesus Christ. It relates his plan for spreading the Good News, debating issues of Jewish Law, and invoking all to live in the wisdom of the Holy Spirit. Time undoubtedly was spent praying about how the Lord was working in his life, what the Lord was requesting of him, future plans, settling up business affairs in Damascus, and other large and small personal issues. I see from the subscription list that this blog site has not lost any subscribers, in fact over the last two years of inactivity it has increased in membership. Thank you! 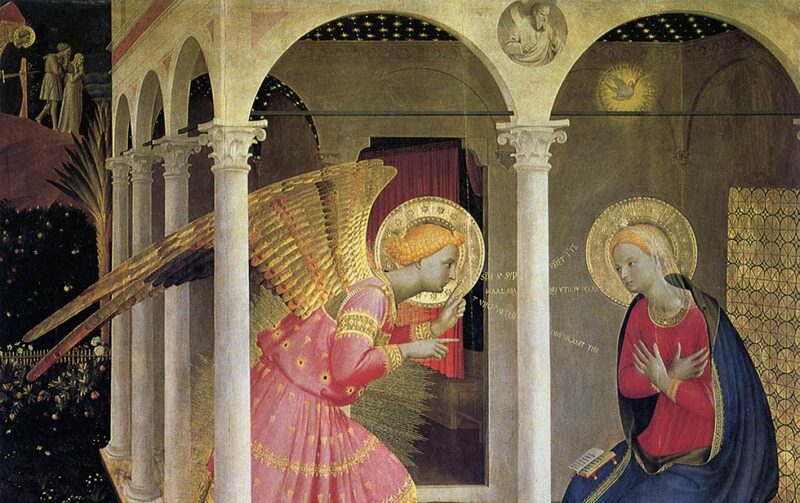 I have plans for new posts for the upcoming months, specifically a series on the spirituality and virtues of Beato Fra Angelico and how they influenced his art. Are the virtues of a 15th century Italian Dominican priest transferable to us? I believe so, because, in reality, they are based on the Beatitudes that all Christians, regardless of Rite or denomination, hold dear. May the grace of Our Lord Jesus Christ be with you. Thanks, talk to you soon. The above sacred image is an unfinished copy of St. Paul based on St. Andrei Rublev’s masterpiece. It is being painted by Deacon Paul O. Iacono. It is egg tempera on a gessoed wood panel. You see, we could spend a lot of time and effort trying to figure out the signs of the times, discussing this visionary and that seer, trying to determine whether or not we are in the actual last days before the Second Coming. We could speculate on how various personalities in the media discuss the deterioration of political effectiveness, the degradation of cultural discourse, or our precarious economic situation. We could also become unsettled over the apocalyptic scenario of what continues to occur at the destroyed Fukushima nuclear plant in Japan, the possible demise of its nuclear core, and the resulting catastrophic impact on the Pacific region. Troubled times were also prevalent two thousand years ago when St. Paul penned his letters to the Greeks of Thessaly. St. Paul was alarmed that the gossiping about current events and apocalyptic speculations were causing disruptive behavior. The Greek word that Paul uses to describe their behavior refers “to actions that interrupt the truthful announcement and living out” of the Good News of Christ. He carefully tells us that these alarmists are false prophets if they are causing such unease as to reduce the effectiveness and the realization of the Gospel in the lives of the people. So what does Jesus and St. Paul suggest? First, we need to take them seriously and not be overly concerned about when the last days will come. Christians should be alert – but not worry; rather, like Noah upon hearing the word of God, they should prepare and rejoice. We need not worry because we have plenty to do in the interim by concentrating our attention on our duties to love God with our whole heart and our whole soul, repent of our sins, and love and assist our neighbors, too. Let us pray that whatever the role we find ourselves in, we faithfully carry out the duties the Holy Spirit has asked us to complete. Each of our jobs and duties are important in the eyes of God. How, and in what spirit we perform them affects our life, and the lives of others, both on earth and in eternity. So let us be worthy of the trust, love, and friendship that Jesus has for us. If we do that, and live in the prayer and grace-filled life of His Word and Sacraments, we will have nothing to fear. Copyright © 2011- 2013 Deacon Paul O. Iacono All Rights Reserved. I will deliver this homily at St. Francis of Assisi Church in Wakefield, Rhode Island on Sunday November 17, 2013.